The Hanukkah fabrics were from P&B Fabrics in their “Festival of Lights” series. Some of the fabrics are still available, but there are also other wonderful Jewish fabrics in quilt stores now. The African fabrics used in the Kwanzaa quilt are from The Unique Spool. The 45 degree kaleidoscope wedge ruler is manufactured by Doheny Publications. Paula found hers at a quilt shop and we have seen them in several shops. If you are unable to locate one, you can contact Doheny Publications via e-mail. They can either advise you where you may find one in your area or ship one to you directly. 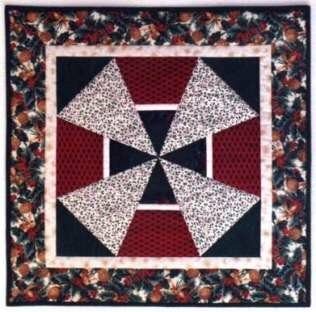 The 90 degree triangle that Paula used to square up the pieces before she sewed the block together was also purchased at a quilt shop. There are several manufacturers for this tool and we don’t think one is any better or worse than another. The important thing is that it be fairly large and easy to handle. If you are planning to make this kaleidoscope wall hanging from Christmas fabrics, you might consider also making "Let's Have a Picnic" at the same time, maybe for a gift! You can use the leftover fabric pieces to construct the watermelon block. "Let's Have a Picnic" also uses the kaleidoscope ruler and the techniques demonstrated on "Simply Quilts". The winter holidays kaleidoscope pattern is available on our website! It is called “Christmas Kaleidoscope" because it was originally designed as a gift for one of our Christmas-celebrating friends. There were three identical quilts displayed on the set of "Simply Quilts": One for Christmas, one for Hanukkah, and one for Kwanzaa.